Note: I wrote this article (a re-worked and edited version of my Winter 100 report) for March 2015 issues of Trainless Magazine, an online collection of articles covering a range of subjects which is put together by Kristyn Bacon. The publish article (which was edited) can be found here. I have re-posted the original and fuller version here. The marathon has been historically viewed as the ultimate running event but once you’ve run a marathon what’s next? For some the chance to travel and experience marathons in different cities or countries became their goal, for others reaching the achievement of completing 100 marathons is their objective and for some its running longer and the lure of completing an Ultramarathon. My journey into Ultramarathon running didn’t follow the typical path of starting to run and build up your distance and events. I jumped straight into training for an Ultra after having suffered a broken ankle playing football and not having done any exercise for 12 months, my running experience at that point was a handful of 10k runs during the off-season from Football and the local Half Marathon. I went from nothing to my first 50-mile race (finishing near the back) running my first marathon in the build up and then took part in my second 50 miler 3 weeks later (again finishing near the back). Despite the slow pace, discomfort, aches, niggles and at times depressive moods I enjoyed the challenge of completing the event. 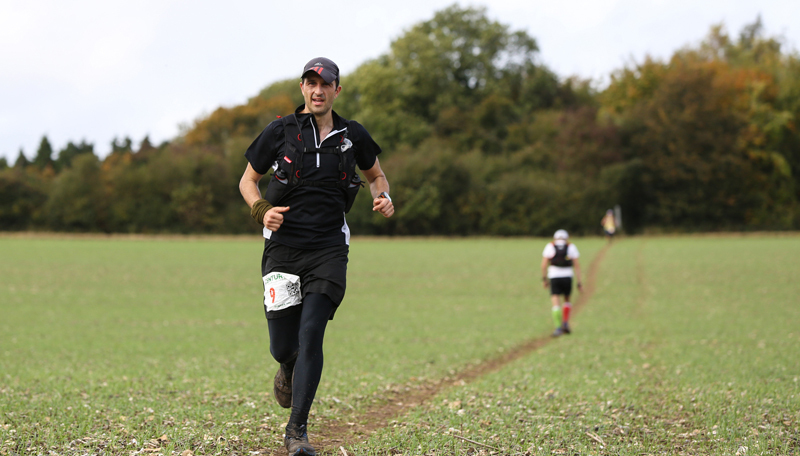 After my first couple of ultra’s, I was attracted to the longer events although at the time I could only recall seeing a handful of events around or above the 100 mile distance (West Highland Way, Grand Union Canal Race, Thames Ring, Ridgeway Challenge for example). 100 miles was a more popular race format in the US but hadn’t really been established in the UK at that time. 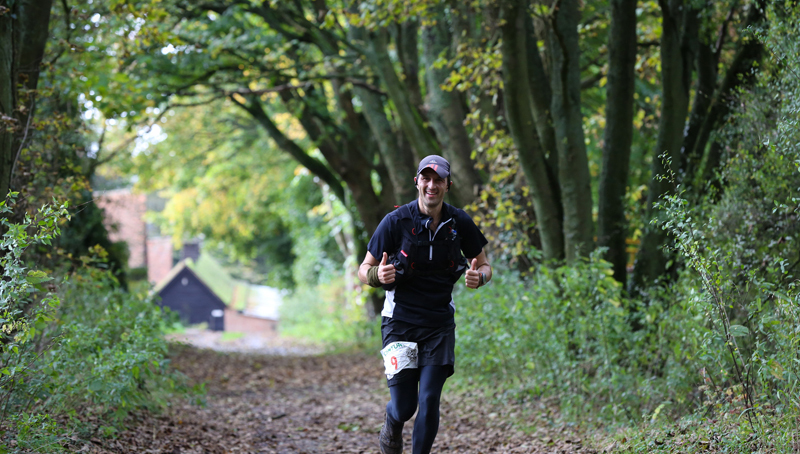 However, at the time of writing there are now over 200 ultra events listed in the UK (source the fantastic www.ultramarathonrunning.com) website of which 30 or so of these are around the 100 mile distance or more. Why 100 miles (or longer)? From conversations and discussions with runners there seems to be a desire from ultra runners to aim towards completing a 100-mile (or longer) run? The ‘challenge’ aspect of completing an ultra can lead to bigger goals. When you’ve run 50 miles, what’s next? For some it may be running faster but for others the challenge and the kudos of having a race distance finish in three digits is the next step. The increase in number of longer distance races in the UK is evidence of the demand. How do you train for the distance? This is not intended to be a training guide article and there are other running coaches or experienced runners who could provide a more scientific insight into training techniques, training cycles, hydration, nutrition and race preparation and training is very individual to ones personal lifestyle and available time to train. Personally, I like to run regularly all year around and have built up from 20 miles a week in my earlier days in running up to perhaps 60-70 miles per week. I may peak my mileage (hitting 100 mile weeks) when training for a target race but try and retain an element of fitness all year round. This is partly because I take part in several events a year and I fit the common profile of a typical hobby Ultra runner where there is a stronger focus on ‘quantity’ of races over ‘quality’ of races. In terms of types of training, I follow a typically pattern of shorter runs during the week with a lunchtime run and a run home and longer runs on the weekend. I ‘try’ and run the odd quality session (weekly hill reps or a tempo run) but if I’m honest I don’t focus on this. In addition, I may run shorter events (say a marathon or a smaller ultra) in preparation for a longer race. Essentially, I put in a reasonable amount of effort as a ‘hobby’ runner (say 10-15 hours per week) which is enough for me to undertake all the races I want but I recognise you could always do more (in terms of quality and not just volume). 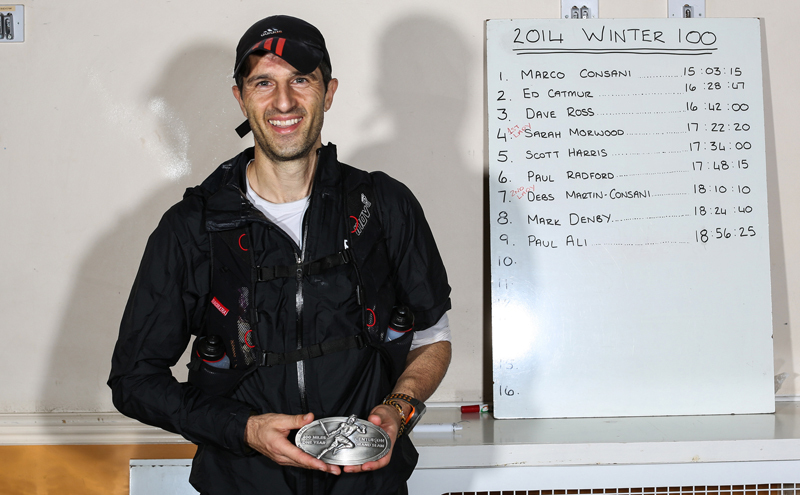 My last 100-mile race was the Winter 100 which took place in October 2014. This was the final event of the Centurion calendar year and the last event which makes up the Centurion Grand Slam of 4 x 100 mile events in the same calendar year. 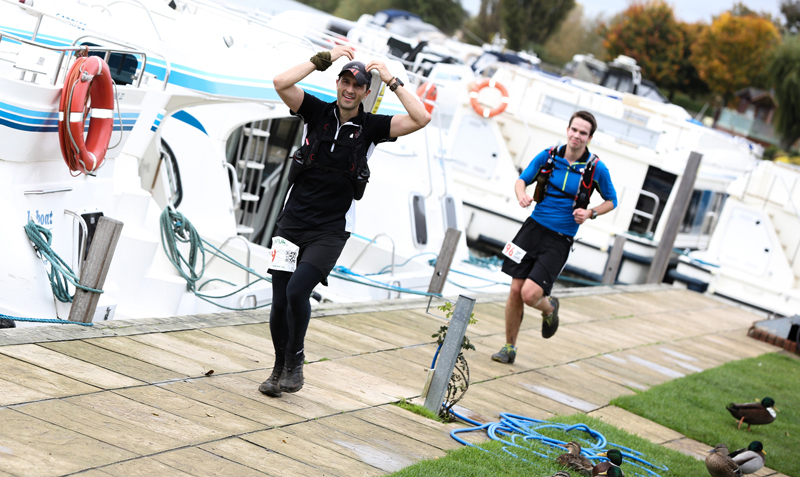 The event involves completing 4 x 25 mile out and back legs along sections of the Thames Path and Ridgeway National Trail. The race was first run in 2012 and at the time was held towards the end of November but was impacted by flooding of the Thames and had to be re-routed (and it rained constantly for about 17 hours I recall) and the event was subsequently brought forward to mid-October. Despite my (above) comments on training, I wasn’t in great shape 6 weeks out from the race with a summer of lots of long races resulting in a cycle of taper, race, rest, taper, race, rest from May 2014 and little training in between and having carried a few minor injuries (another trait of a typical hobby ultra runner). My race results and fitness had also been on a decline since that time. The training didn’t quite go 100% to plan as I continued to experience a few minor niggles (sore knees and sore Achilles) which was symptomatic of my year. I also suffered a sprained ankle three weeks out from the race when running which saw me having to hobble 10 miles back to my car on one Sunday morning run. However, despite not hitting the mileage I wanted to and having to take a few days of enforced rest I did get all my long runs completed each weekend and also completed the Purbeck Marathon and my final run at the Longmynd Hike (a hilly 50 mile run or hike) two weeks out from the race which then gave me a couple of weeks of rest all my niggles, taper and rest. In summary, I was feeling 90% fit but not quite the 100% fit but I had some extra motivation after a poor effort on my last race and a bit of a side bet with a friend over my performance and eventual result. The Winter 100 is a local event for me and I live a 20-minute drive from the start and knowing (and having recce’d) each leg of the course gave me a little advantage. The plan for the race was a sub 20-hour finish broken down as 4hrs for leg 1; 4-5 hours for leg 2; 5-6 hours for leg 3 leaving me with 6 hours for leg 4. If I could get back to Race HQ at the 75-mile point by midnight (14 hours in) then I was fairly confident I could march out the final leg in 6 hours. I adopted a slightly different mindset for the race and rather than assume my typical position somewhere near the middle to back of the field at the start and then working my towards my general pacing group, I elected to start near the front with fellow club runner Wendy Shaw. It was Wendy’s idea to go for a fast (but not quite suicidal) but comfortably quick pace and we set off near the front of the field. Wet weather had been predicted all Saturday but whilst it was overcast, it wasn’t raining and it was reasonably humid. I had decided to wear my leggings as I didn’t want to faff around putting them on if it rained or got cold at night but just wore a T-shirt at the start and was carrying a spare base layer and waterproof jacket if needed. We set out quite quickly from the start at the Village of Goring, west along the Thames Path towards the turn point at Days Lock. This leg was a mixture of muddy paths, fields and some road. The ground conditions were a little tricky in places resulting in a few runners falling over on the way (including me). The ‘out and back’ route nature of the route means that everyone passes each other and as I got within a mile of the turn point the lead runners were already on their way back and it was great to see the top guys in action (the girls would overtake me a little while later into the race!). After a quick stop and a quick water refill on the turn point it was back on the return leg which then resulted in me passing a stream of runners coming the other way and giving a wave, hello, high five or a well done and headed back towards the start. The track path sections on the way back were a little more tricky after 150 odd people had passed through and I had to take care on some sections after stumbling once or twice and it was actually quite nice to have some road and pavement sections to break this section up. I arrived back at the start in 3hr 37mins towards the top end of the field and ahead of schedule. Running too hard too early in a race of this distance can result in a runner suffering later in the race but this was slower than my marathon time so this (for me) was a comfortable but fast pace. With the 4 x 25 mile leg format of the race, the Race HQ was a busy place of operations for the next 30 hours with willing volunteers assisting runners at all stages of the race. 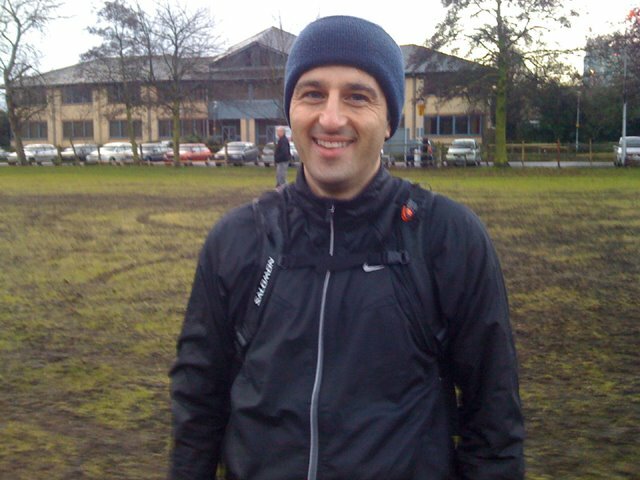 The Centurion Running experience is first class with a loyal following of runners and helpers at each event and I was in and out of the Aid Station quickly having grabbed some food and topped up my water supplies adopting a food and hydration technique of eating and drinking a little but often. The second leg saw runners follow paths and pavement for a mile or two before following the Thames river path for a couple of miles after which it’s more of a traditional trail route covering subtle gradual incline through bushes, trees and more wooded areas. The weather was overcast and cool but there was some sunshine and this was a great leg to run particularly on the turn when it felt like there was a lot of downhill. I ran by myself for a few miles passing through the interim Aid Station grabbed a few snacks and a drink. I ran together with another runner (Scott) briefly before he moved on ahead and the lead female runner (Sarah) then passed me around the section before Grims Ditch looking very strong. As I got within a few miles of the turn point to see the two leaders hurtling back towards me at breakneck speed with third place about 15 minutes behind them. Once again, the out and back nature of the race gives everyone a chance to see how other competitors are fairing from those at the front to those at the back of the field. I caught up with another runner (Paul) who I had spent some time with in the few weeks prior to the race recce’ing the route and we ran into the Aid Station together grabbed some food and drink and then spent a few miles together on the way back. We were covering an area of runnable and slightly downhill terrain making some good pace. When you are running a race of this length its important to run your own race. The few miles I spent with Paul (who is generally a quicker runner than me) felt like I was working a little too hard at that point in the race and eventually Paul continued on at his own preferred pace. It was good to share a few miles with some good company but I had to consider what pace would work for me. I was ahead of my planned schedule and looking to arrive back at the half way (50 mile point) under 8 hours. A friend had agreed to pace me for the next 25-mile section and I slowed to a walk to make a quick phone call to advise him I was slightly ahead of schedule. Thankfully, he had the presence of mind to check the online tracker and saw I was doing ok and was there when I arrived. Some races allow a buddy or a pacer and they can be useful from having some company, help with motivation on the run and offer some additional safety during a night section of the race. In addition, it can be a great way of getting other people (runners and friends) involved in a race. Strangely, not every runner wants to participate in an ultramarathon! However, some races do not allow the use of pacers and you should always be prepared to run the race by yourself. I’m quite relaxed about having a pacer. It’s great to have a bit of company on a run but equally I feel comfortable running by myself for long periods. We had agreed my pacer (Paul Stout) would run leg 3 which meant it was a Saturday evening run and I felt this was the critical section of the race. I reached the halfway point feeling motivated and in control of my race and had actually run one of my quickest 50 mile times. However, you don’t run a PB pace without having a few aches and pains and I was glad to change into a pair of Hokas and enjoy the comfort of some additional cushioning on the feet which was starting to feel a little sore. I was in 9th position have gone out at a quicker pace than usual and knew from this point I would start to slow. It was now 6pm and getting dark as we headed into the evening section of the race. The plan was to run the flats and downs and hike the gradients for the next leg and see if we could get complete this leg in around 5 hours which would then give me a comfortable 7 hours for the last leg to finish under my target. The first few miles were roads and paths as the route led onto the Ridgeway before a steeper section as you got into top of the Ridgeway and then it was a series of undulating terrain. We put our head torches on after a few miles as it got dark quite quickly and then kept our run/walk pace going. A lot of the terrain on this leg was pretty runnable with good quality track/path (if a little stony in places) although there were a few wet and muddy sections to pass through. I was pretty familiar with the navigation and we passed a few people who had missed a turn and directed them back on course which was a nice advantage to have in your locker as it provides confidence over your directions, knowledge of which sections are runnable and which ones you can take a break and generally just saves you time. It was home turf advantage for me. My pacer (Stouty) did a great job keeping the conversation going and keeping me motivated although my legs were really starting to feel it and I found it more difficult to consume food as my body started to reject it (I started to convulse slightly when I tried to eat something). I found fruit to be the most palatable of foods to digest because its largely liquid and has a nice sharp taste and I started to survive on tangerines, melon slices and grapes primarily but I knew I wasn’t eating as much as I normally do. We ran/walked/hiked towards the interim Aid Station, paused briefly for a cup of tea and then we pressed on. I was starting to feel the need for a toilet break to the extent I was having a slight stomach ache but I was hoping to get back to the comforts of Race HQ rather than using the outside facilities (i.e. a bush). We jogged/marched/plodded to the turn point and Aid Station and could start to see the twinkling of head torches approaching us from the opposite direction as other runners were heading towards us on the “out” leg. The return leg felt more downhill than up and we jogged the downs and most of the flats and hiked the gradients (however gradual). I was definitely feeling the effects of the first 50 miles now as my legs were sore and aching (generally the hamstrings/quads) but we kept pressing on and were just about on course to complete this leg in 5 hours-ish. We were passing runners coming in the opposite direction reasonably regularly now and kept offering a well done, wave or acknowledgment as is the norm for these races although as it was pitch black it was hard to distinguish who people were. Stouty kept me moving, kept prompting me to run and I generally responded to this despite aching legs and a slightly nervous stomach. I was looking forward to some hot food and drink at 75 miles as well as a visit to the toilet. I arrived back in the Checkpoint at 11pm and immediately dashed to the toilet (ahhh relief) and then tried to eat some chilli and bread which one of the Aid Station volunteers handed to me as another helped me with my bottles. I tried to eat the chilli, nibbled on some bread but couldn’t really consume anything at all and headed back out for the final push. Stouty was leaving me here having pushed me along leg 3, it was just my hometown stretch now. 13 hours into the race and I had a comfortable 7 hours to go to complete the last 25 miles. The hard work had been done and I was feeling the aches and pains now. The last stretch of the race is pretty familiar with the few miles into my hometown of Reading and this leg would be completed in the dark during the early hours of the morning. I marched the first mile and grabbed a few shot bloks from my pack and tried to eat these but my body wasn’t reacting well to food and I convulsed and then spat these out .. back to fruit then. After this point I tried to run some small segments. I find it mentally difficult to string together even a slow run in the latter stages of a race and find myself running in short bursts and this is what I started to do managing to keep the pace down to 11.30 – 12.30m/m. I passed through the interim Aid Station and pushed on. A few miles later I spotted the tall grinning form of Marco Consani (the race leader) who passed me at this point and I gave him a wave. By this point he had a commanding lead as it was a little while later that Ed Catmur (second place runner) passed me on his way to the finish. The rest of the route to the Aid Station followed my usual lunchtime run and I plodded my way along the well lit path past the Boatyard, my office (which was a little strange seeing it at 2am in the morning) and finally over the horse-shoe bridge to the turn point at the Boatyard. By this time the top ten runners were on their way back and Dave Ross, Sarah, Paul Radford, Debbie Martin-Consani and a couple of others had all passed me. I counted the number of runners on the way back which confirmed I was still in 9th place and when I got to the Aid Station. Unusually I was the only person there and had the benefit of silver service treatment from the couple of volunteers on hand at the time. I had a quick cup of tea and some fruit as that was the only food I could manage and then headed back. I was feeling pretty drained by now and I knew I hadn’t eaten the amount of food I normally would and found myself struggling to motivate myself to run at all and initially settled into a fast march on the way back. Based on my time, I was looking at a 19hr finish. I did try and run in short bursts although there was no real discipline here it was simply a case of spotting a lamp post and running to it, marching and then finding the next landmark such as a bench, lamp post or head torch and running towards it. I started a game where I tried to make sure I was running each time someone passed me in the opposite direction. It all helped to keep the miles ticking over. About three people were close behind me (within 5 minutes time wise) of the turn and I assumed they would catch me up and overtake me as they were all running and I was feeling my lowest around here and I started to work out a point on the way back where I thought I could hold my position. I decided this was the 90 mile point as anyone I passed there would be 5 miles behind (2.5 to the Checkpoint and 2.5 back). As I passed through the familiar sites of Reading it started to rain. It didn’t feel heavy at first but was constant for an hour or two. I decided not to put my water proof jacket on initially as I was less than 10 miles to the end and simply couldn’t be bothered but after a while I could feel the rain had soaked my top-layer and was seeping through to my base layer and I paused briefly to put my jacket on. In all honesty, there had been no running for the last couple of miles before the interim Aid Station point before the end. I stopped here for a cup for tea and briefly sat before quickly realising I was just wasting time and I thanked the guys and headed out for the final few miles to the finish. Looking at my watch I was on for about a 19 hour finish which would be actually be a new Personal Best time by 40 mins which was good but I couldn’t help feeling that there was a bit more to give if I could have motivated myself to run a bit more of this last leg. It was a slightly surreal position that I was well under my target and at some level didn’t feel the need to have to work any harder now. I suppose after 18+ hours of exercise you can be excused for slacking off a bit. I followed the wooded section and couple of hills away from the river taking care to avoid the tree roots covered by fallen leaves in the dark. By this point, I hadn’t been caught by any of the three runners who were seemingly close behind me on the turn and whilst I assumed that they would catch me earlier and I probably would have just let them run on, I now felt the desire to defend my position and gradually I started sneaking in short running segments even if it was a 50 metres here or there or perhaps longer on a downhill stretch. By the time I got to within a couple of miles of the finish I didn’t want to be caught and with the clock ticking over at 18.30, I really wanted to sneak under 19 hours (18.5x something sounds so much better than 19.0x hrs something) and started to jog a bit more through the fields and various gates and back onto the path. 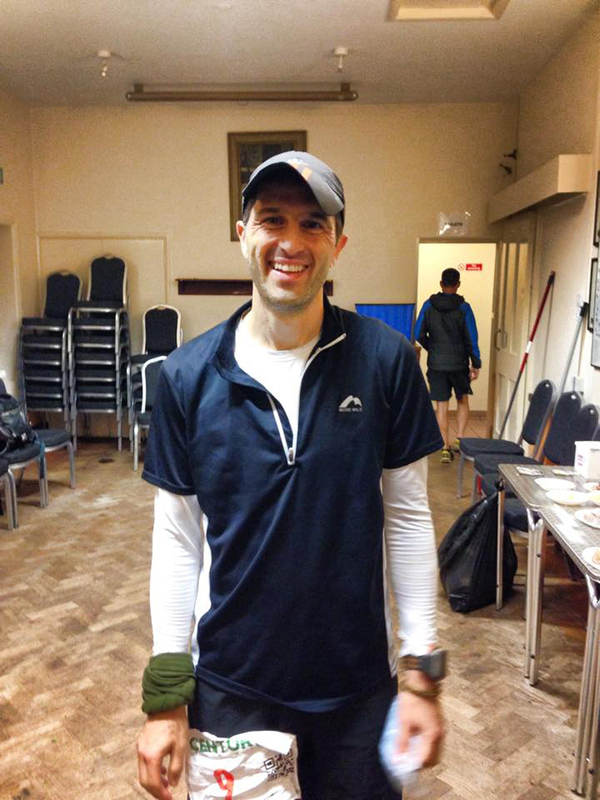 It was still completely dark as it was approaching 5am in the morning and Streatley Bridge took an eternity to appear but as soon as I saw it I broke into a sustained jog and ran into Goring Village Hall for the final time to finish in 18hrs 56mins. As is typical with races of this distance, there’s no feeling of elation, no rush of adrenaline, no emotional out-pouring.. it’s simply a feeling of relief from it all being over. The simple act of just sitting down and not having to get up is very welcoming. 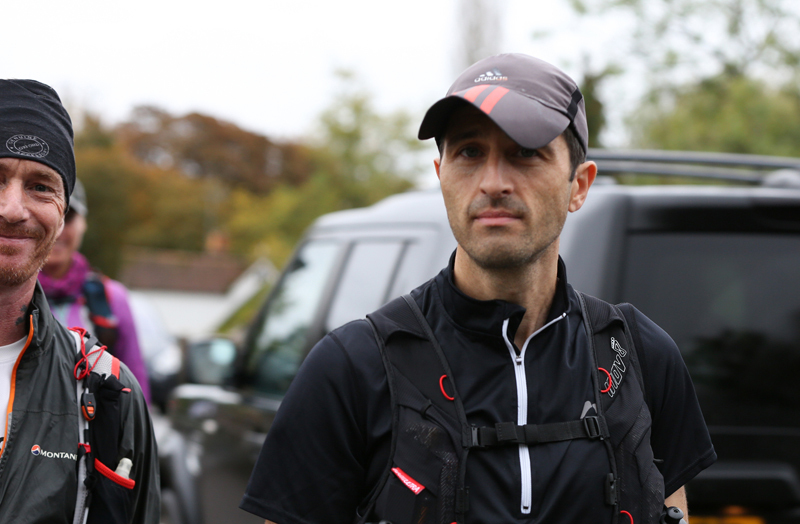 As you start to reflect on the race, consider the moments when you lacked motivation or as the aches and pains start to disappear you start to think where you could have saved some time on the run. A typical Ultra runner is never satisfied with their performance. The finishing time was a new Personal Best and I managed to hold onto 9th position and completed the Centurion Running Grand Slam of events, so it was a fine outcome overall. With a race of this distance, I’m a firm believer that you the preparation and training you complete beforehand are the things that will get you through the race. A final thanks to the Centurion team and their army of volunteers who supported and put on a well organised race.